Whaling boat “Sondra”, with whale boat “destiny” in the background, photographed at bunker pier in Leith Harbor in 1947. Watercolor painted by Jim Rae. This is not a photograph, so it should fall a bit outside, but there is so little material available on this topic in the colors that I make exceptions. Thanks Jim. It's really good! More on the “Southern Breeze” here. More on the “Southern Maid” here. Sandefjords a museum “Southern Actor” on field. Posted with permission from The Whaling Museum in Sandefjord. Salvesens hvalbåt “Southern Lotus”. Built as HSE “Phlox”, launched as HMS “Lotus”. Taken over by the Free French Navy in May 1942 and renamed “Commander d'Estienne d'Orves”. Returned Great Britain in May 1947 and again given name “Lotus”. Bought by South Georgia Co.. i 1948. Bøyebåt 1948-1952, Whaler from 1953 to 1963. 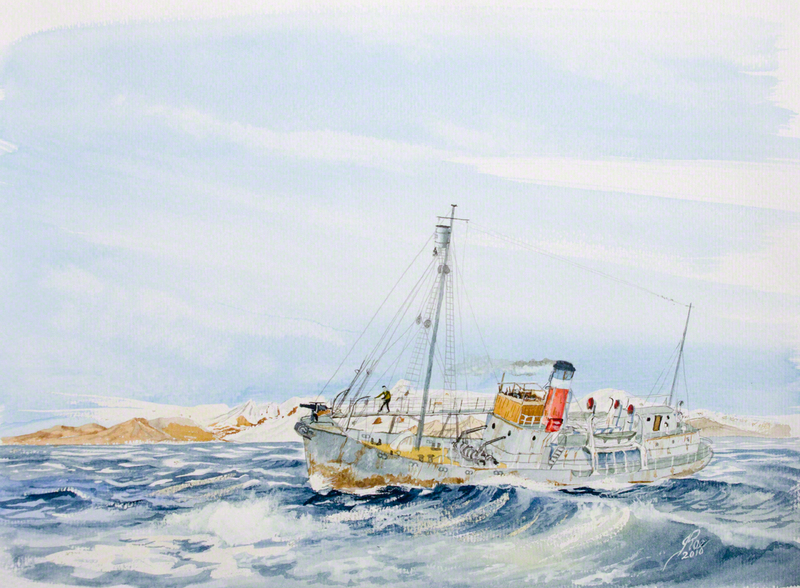 Whaling boat “Star I”. Presumably outermost Sandefjordsfjord. Considering the good condition of the hull, it is perhaps a trip on the fjord to test equipment or verify repairs before season.